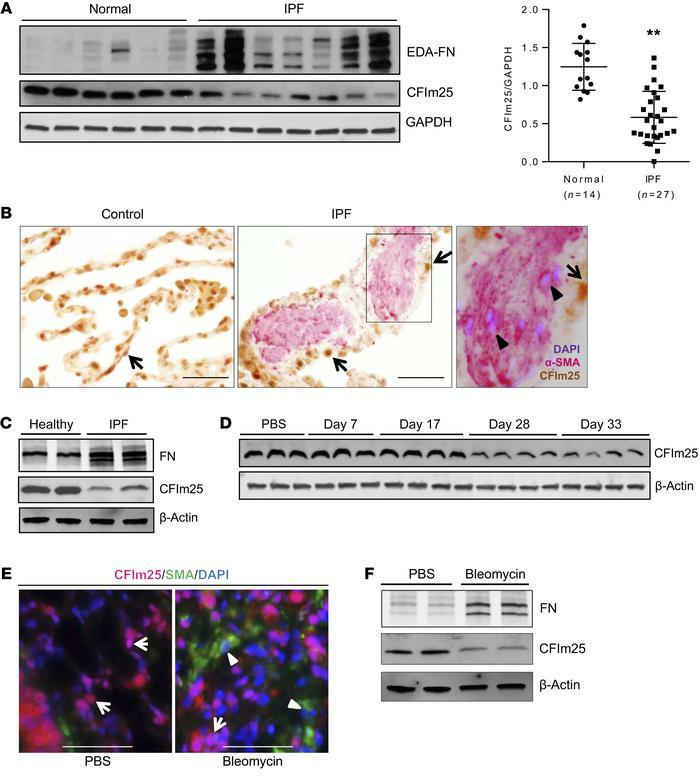 CFIm25 is downregulated in fibrotic lungs. (A) A representative Western blot showing protein expression of CFIm25, FN, and GAPDH from 6 healthy and 7 IPF lung specimens. CFIm25 densitometric analysis shows significantly downregulated CFIm25 levels in IPF lungs. **P < 0.01, by unpaired t test versus healthy control. (B) Immunohistochemistry for CFIm25 (brown) and α-SMA (pink) showing cellular localization in control and IPF lung specimens. Arrow indicates CFIm25-positive cells. Arrowhead indicates α-SMA–positive but CFIm25-negative cells. Scale bars: 100 μm. Original magnification ×100. (C) Western blot shows CFIm25, FN, and β-actin protein expression levels in primary fibroblast lines derived from healthy or IPF lungs. (D–F) Mice were i.p. injected with PBS or bleomycin biweekly for 4 weeks. (D) Western blotting was performed to analyze the protein expression of CFIm25 in whole-lung lysates on day 33 after PBS, or 7, 17, 28, and 33 days after the first bleomycin exposure. The different lanes represent samples collected from distinct mice. β-Actin was used as a protein loading control. (E) Immunofluorescence was carried out to determine CFIm25 (pink) and α-SMA (green) colocalization in lungs from mice exposed to PBS or bleomycin for 33 days. Arrows indicates CFIm25-positive cells; arrowheads indicatesα-SMA–positive but CFIm25-negative cells. Scale bars: 100 μm. (F) Primary fibroblasts were isolated from day-33 PBS or bleomycin-injected mouse lungs. Western blotting was performed to determine CFIm25, FN, and β-actin protein levels.